with no SDI, there is no RAW output recording with any existing cameras. It is useless for the Sony FS700R and FS5 (I or II) in gaining 4K 120P and 60P, which one can do using the 7" Inferno. The benefits for existing cameras: this will enable owners of the GH5 and GH5S to record 4K 60P in 10bit, and all of those many Sony RX0 owners to record 4K 30P in 10bit. Otherwise, for most owners of mirrorless cameras it permits just higher bitrates at 8bit 422, for which almost no one sees a significant difference. If one needs just a nice HDR screen, one is better off with a model without the recorder to get an even more compact form with better battery life. And while I am in a pessimistic mood: the fact that it uses a new form of storage that is not a standard means it is likely that (1) this product will not be available for a while and (2) the storage will be expensive. Currently the Inferno uses standard SSD drives (which are still expensive). Am I going to get one - yes. So at least storage doesn't seem like storage would be super expensive - just the price of an SSD plus $6. I want one of these, now! So much better on a hand-held rig. @eaststoomuchjam Yes, I did just see the Ninja V works with the same caddies as the other Atomos units too. It will just stick out some from the body compared to the new shape. I wonder what the "modular expansion unit" will bring - hopefully SDI! I've been waiting for this it solves many of the problems with any brand that has recording limits among other things. Fingers crossed there is an Atomos Samurai V in the future. So would I buy this and finally get 4K for my A7s (mk1) or get an A6300 for just 100$ more? I’ll lose lowlight and supposibly dynamic range but gain better color science and better autofocus for my two Sony lenses. With a speed booster for my Canon FDs I’ll have basically same field of view. I could see there being a cable to connect the expansion port to proprietary LCD connector on EVA1 to get video, audio, and power and maybe for the ProRes Raw. Seeing as how they have several promo photos of this with the GH5 and Atomos CEO said to push and scream at camera manufacturers to add raw out on their hdmi cameras, I wonder if the hardware on the GH5 and GH5s would allow raw out over HDMI. @Vitaliy_Kiselev do you know if this is physically possibly with just a firmware update? Any one heard anything about rumors of a SDI version coming out this year?? I would think that there would be an SDI addon module that attaches to the expansion port, not a separate version with SDI. @markr041 you referenced RX0 (I assume you mean all revisions of RX100) as having 10 bit output over HDMI. Could you link to independent confirmation? I don't dispute it, it will be a factor in deciding to buy a RX100 VA, which records 420 8bit internally. No. I meant the Sony RX0, not any RX100. It is the only camera with this spec. 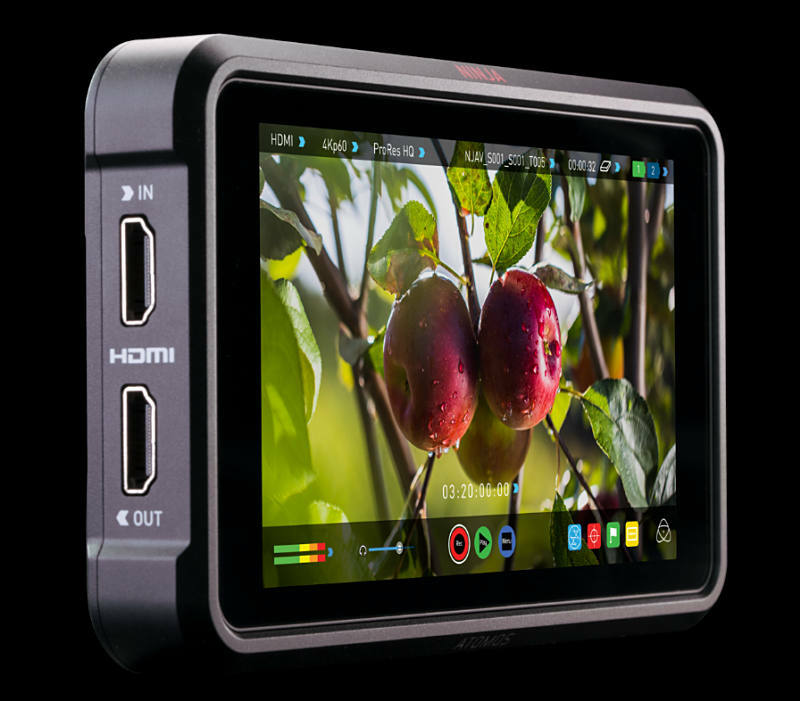 See the description of its HDMI output on the Atomos web site. It was also confirmed by someone on the EOSHD forum. I didn't know RX0 was a thing. Looking it up now. Edit: Q&A on Amazon says RX0 HDMI output is 8bit 422. I have no use for the form factor anyway, and the lens starts at f/4. BTW is there a compact camera (any brand) with a built-in zoom lens that has 10bit output? That "answer" on Amazon was not from the manufacturer, unlike some other answers, but quoted from a private blog site. 10bit 422 via HDMI on the Atomos site, 420 8bit internal. And it was tested. It is a specialized camera indeed. No other Sony compact camera for sure has 10bit output. Hmm. We're off-topic wrt to the thread, but since we're there already: what's the use case for RX0? It's not an action cam (needs gimbal). Starts at f/4 so outside cam but watch the lighting (has ND attachment?). Underwater cam maybe? I read the IQ is awesome compared to Hero6, but since it doesn't have internal stabilization they don't compare well. I might care for it if I understand the use case over a RX100. Edit: since it syncs in a fleet of RX0's I guess it's meant for fly-on-the-wall shots, in tight corners or rough environs. It won't replace but complement a RX100, just like RX100 would complement my PXW-Z90. There is a changeable faceplate with a standard screw on thread precisely for ND filters or polarizers or close-up filters. I forget the mm, but it's a standard size. Comes with lens shade and uv filter (for protection if not using a filter). Mounted on a small gimbal, attached to the tiny Ninja V via HDMI and you have stabilized 4K 422 10bit video (Slog2 for HDR) in a small rig! @radikalfilm It doesn't have a built-in zoom lens, but you can change the lenses on the Black Magic Micro Studio Camera 4K which is very small and it outputs 4-bit 4:2:2. You could pair it with something like the Olympus 14-42mm power zoom which is also tiny (and it only like $200). It's not the best lens in the universe, but it's probably sufficient for anything you'd be using such a small camera to shoot. @eatstoomuchjam that micro studio thing has no built-in recording! You can't use it without an external recorder (which implies some sort of rig), so it has none of the form factor advantages RX0 has. If Sony follows up and fixes those, I can see myself taking a couple of them on set. This is a tight quarters camera, for shots where the A-cam doesn't fit or you don't want to risk damaging it. Your gimbal+RX0+Ninja V setup makes no sense for me, just so you get 422 10bit 4K. Not worth the hassle. You still need to plug in sound, so it becomes a frankenrig. This is not meant as A-cam! Get a PXW-Z90 for A-cam (same sensor), or wait for the BM Pocket 4K if you must have 10bit. That's why I mentioned it doesn't have a zoom lens, but that you can get a cheap one with sufficient quality. If you want a compact camera of that size that can record 4K internally and can handle it being 4:2:0, then you're already on the right track with the RX100. Otherwise, the Z-Cam can do it, but it's still a headache to use. Caleb got a Ninja V to mess with finally. Seems like good pairing for the Z6. It's really not much more expensive than a good monitor to be able to record 4K60 10-bit Prores. Melbourne, Australia – 13 September 2018 – Atomos is delighted to announce that the highly anticipated Ninja V 4k HDR monitor/recorder is in mass production and on schedule to reach stores before the end of the month – fulfilling our commitment to deliver in Q3. The all new 5" 4kp60 HDR monitor recorder has unrivalled features in a sleek, compact and extremely light form factor that is perfect for mirrorless cameras, DSLRs and gaming consoles. The 10-bit mirrorless revolution The timing of shipment coincides with the launch of several new mirrorless cameras with 4k 10-bit HDMI output and Log gammas that partner perfectly with the Ninja V. The new Canon EOS R, Nikon Z6 and Z7 and Fujifilm X-T3 now join the Panasonic GH5 and GH5S in taking full advantage of the Ninja V 4k 10-bit 422 recording to Apple ProRes or Avid DNxHR. The results from the Ninja V and these cameras are extraordinary, with billions of shades of color for smooth gradients and better grading in all NLEs. New AtomX modules under $199 – the most flexible ecosystem in Pro Video Modularity is at the heart of the Ninja V with a bi-directional high-speed expansion port breaking out connectivity for I/O of video, audio and power. Atomos created AtomX to ensure users could adapt and connect to any legacy or future wireless or wired video standard. The expansion system offers endless scalability and is demonstrated by the first of many modules - the AtomX Ethernet/NDI® $199 and the AtomX Sync $149 announced today. These dock into the AtomX port and instantly add important features like NDI® over ethernet and Wireless Sync and Bluetooth control to the Ninja V.